Jumping back south into Hastings for today's photo. 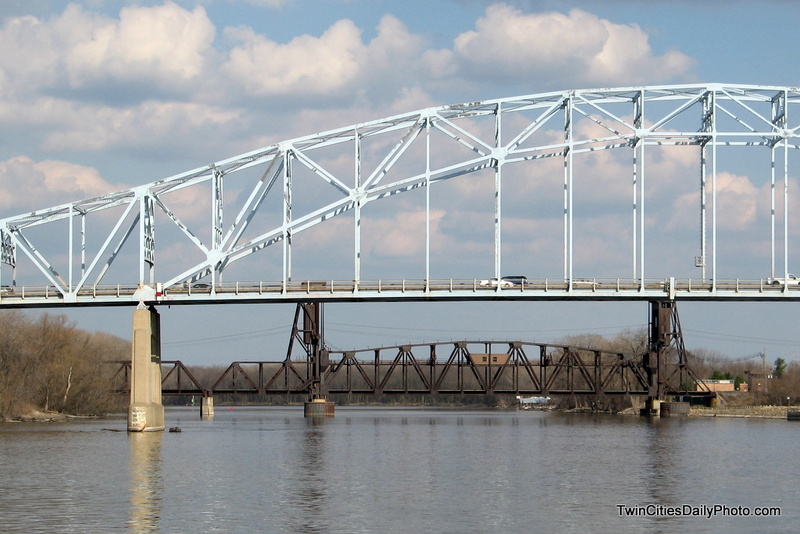 It features two of the bridges that cross the Mississippi River, The Milwaukee Road [rail road] bridge, and the Hastings Bridge. The Hastings Bridge is slated to be replaced starting the the fall of 2010. The project will take 3-4 years to complete. I have posted about construction of this bridge in May of 2008. There was some major bridge maintenance work being done to it that essentially prolonged the life of the bridge until State funding was available. Before last years maintenance work, it had one of the lowest bridge ratings scores in the state. Beautiful image. Love the lines of the bridges.